We enjoyed our hike last weekend so much, that we decided to go back for more! We changed the trail this time, and did the slightly shorter Half Note Trail instead. And what a difference a week makes! INstead of cold and overcast, we had a beautiful sunny day. The downside was the the empty trails from last week were crammed with people. Not nearly so much fun. But we persevered, and decided to do the slightly shorter Half Note Trail instead of High Note. That worked well, as we got see all the wildflowers again, and almost all the people stuck to the more popular High Note, so the second part of the hike was much quieter and more enjoyable. Same spot, this week. Much nicer. So I think the format last week worked out pretty well. So I will try again, and hopefully everyone likes it! 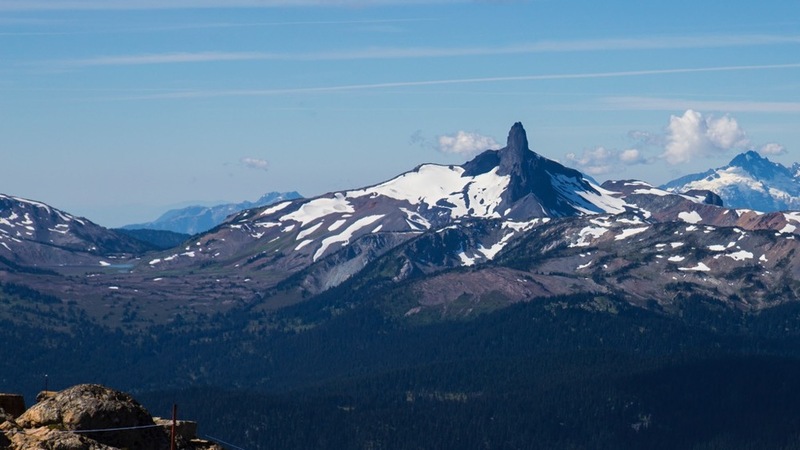 Black Tusk was highly visible throughout the days' hike. 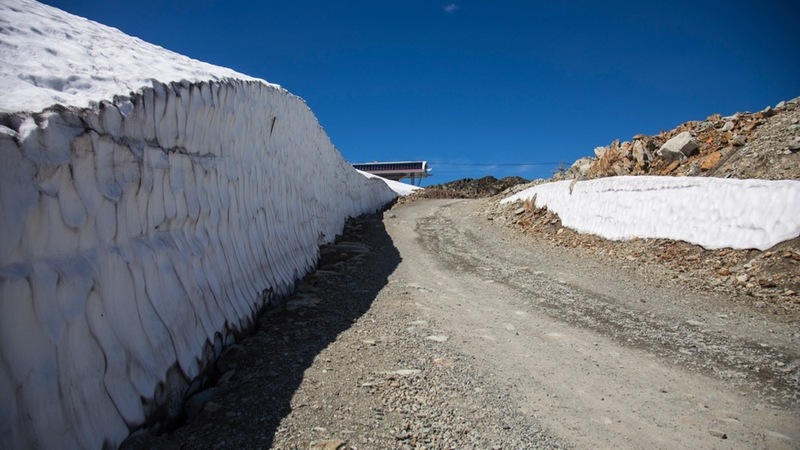 There was a little bit of snow still left at the top of the Peak Chair. The views today were amazing! We started off again on the High Note Trail. This time, we could see where the trail was taking us. 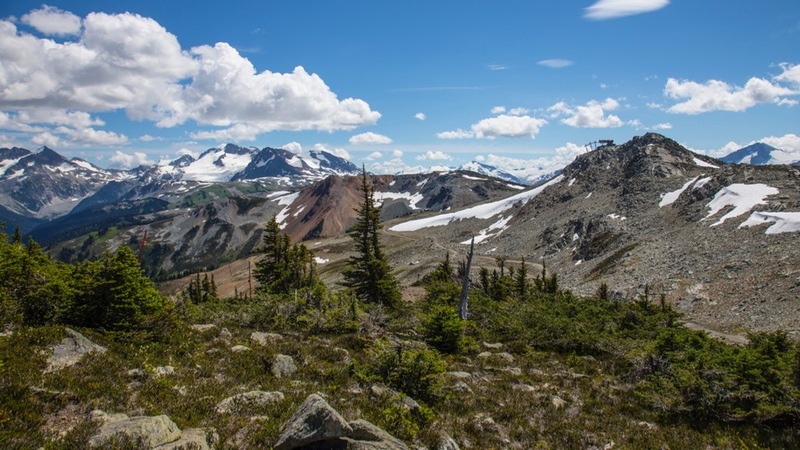 Another amazing view out to Black Tusk. Limbo on the mountain tops. Last week, this part of the trail seemed to disappear into the clouds. 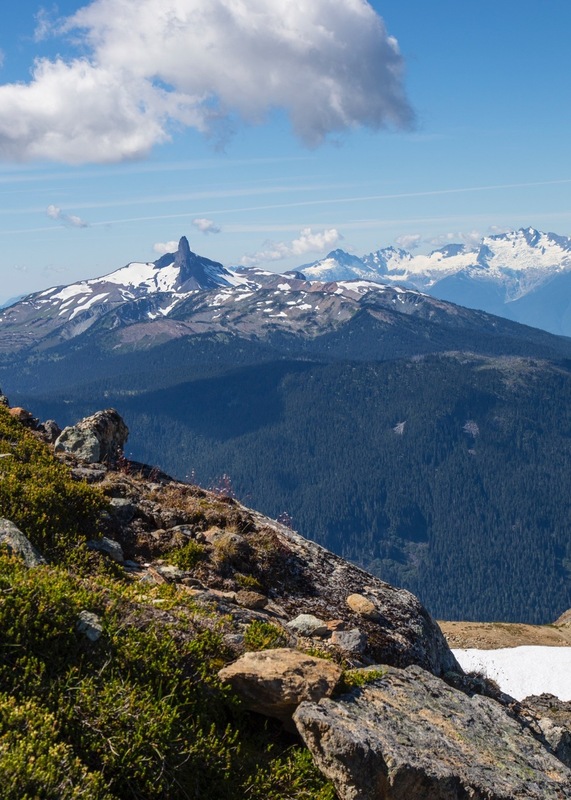 This week, the view was worthy of a photo. The trail seems to lead off to the horizon. 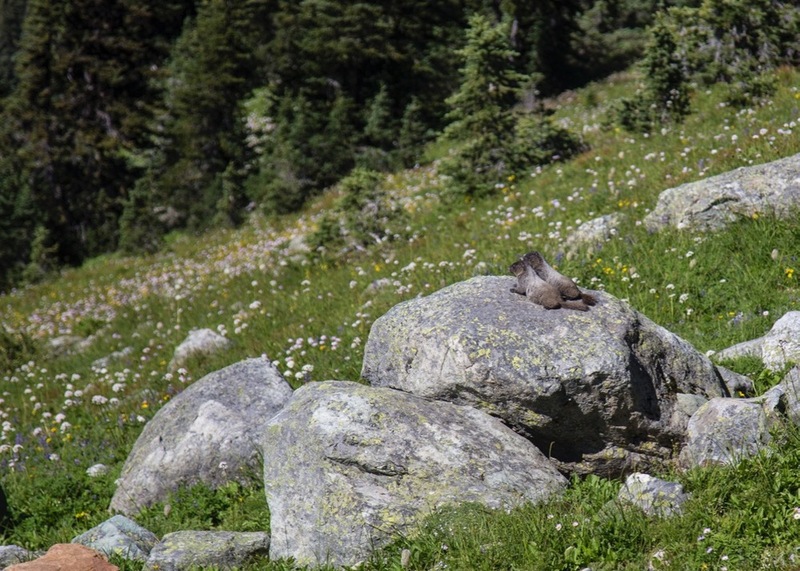 We didn't see as many this week, but there were some good marmot sightings. 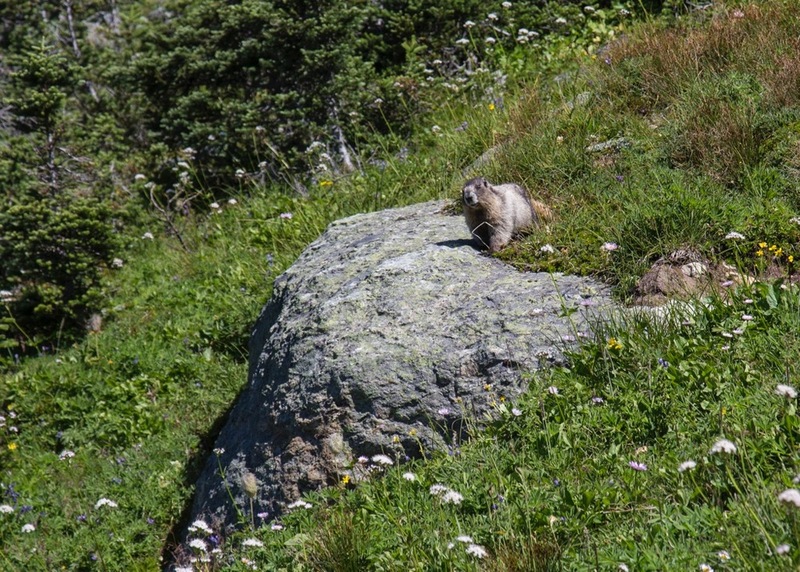 A couple of young marmots, sunning themselves. This pair were pretty close to the trail, munching on wildflowers. 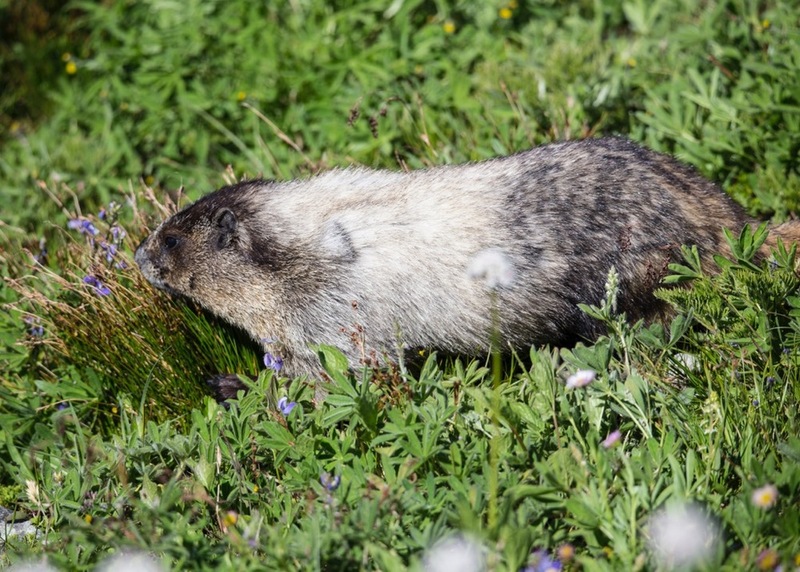 I pulled out the big lens to get some marmot shots, but it also gives a nice close up view of Black Tusk. 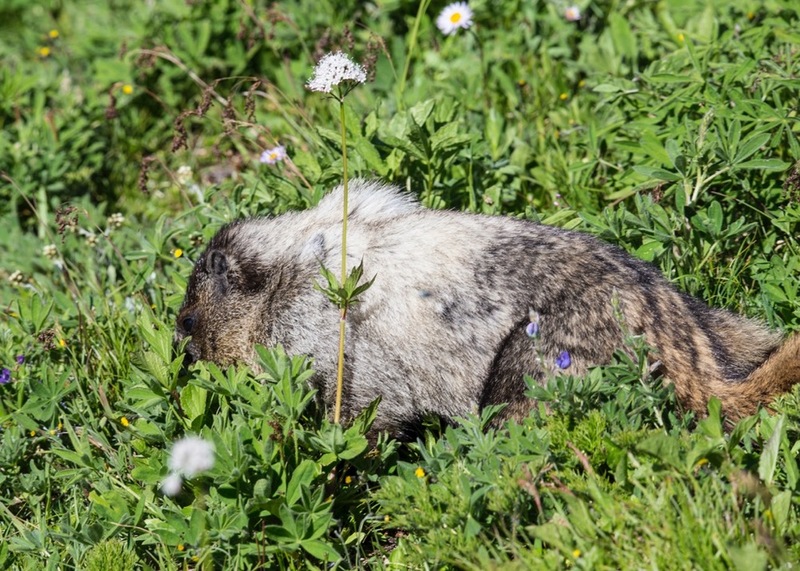 A closer look at one of the marmots. This one ran all the way down the hill from up above us. Sirprising, given how many people were out and about. 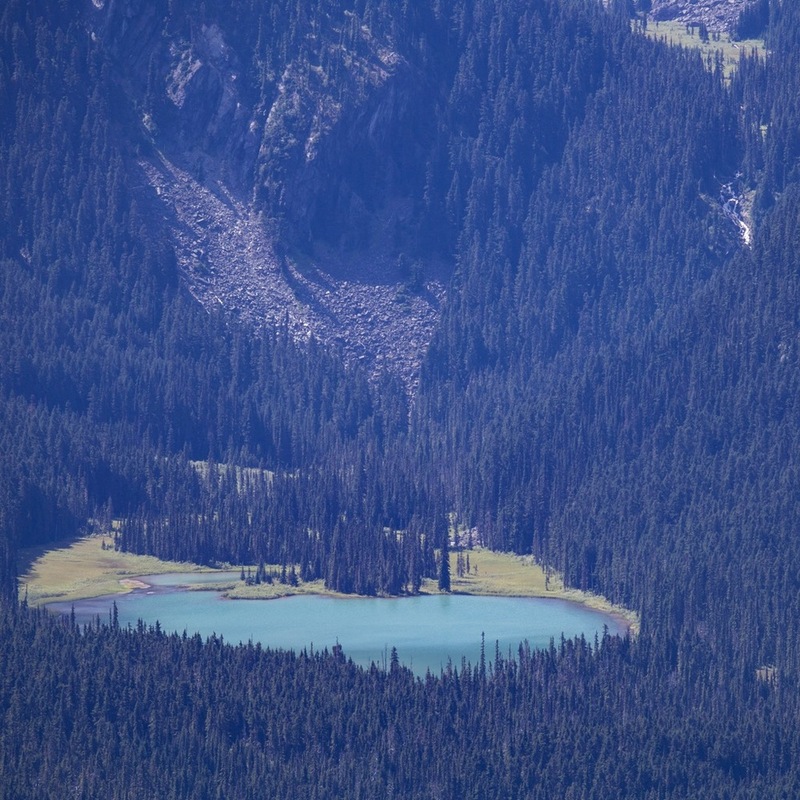 Again, the telephoto lens allows a better view of our favourite little lake, tucked in the mountainside. An amazing assortment of wildflowers, framed against a perfect blue sky. Even with tons of people on the trail. 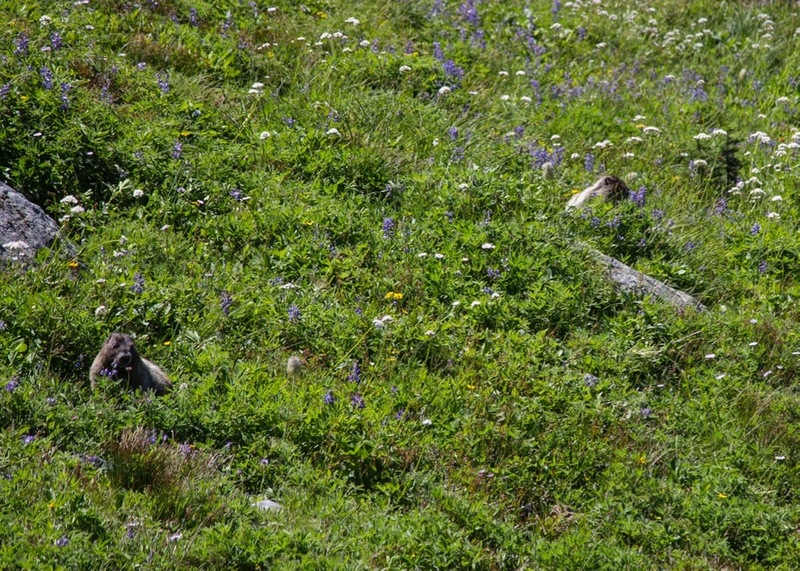 this one marmot was unafraid to use the path too. A beautiful view of wildflowers mountains and rivers. This is why we live here! 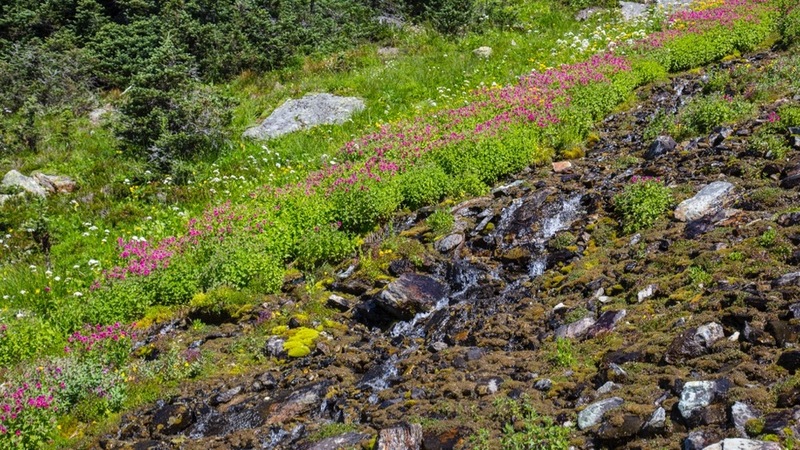 This little stream tumbles down the mountain side. 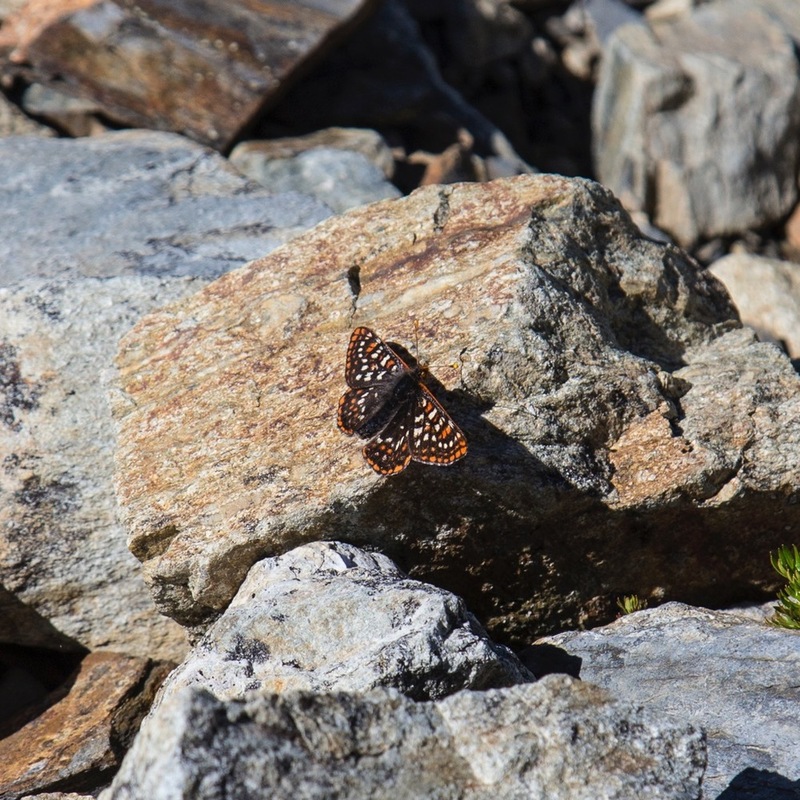 There are a million butterflies out in the sunshine. They never seem to stop, but I did get a picture of one. 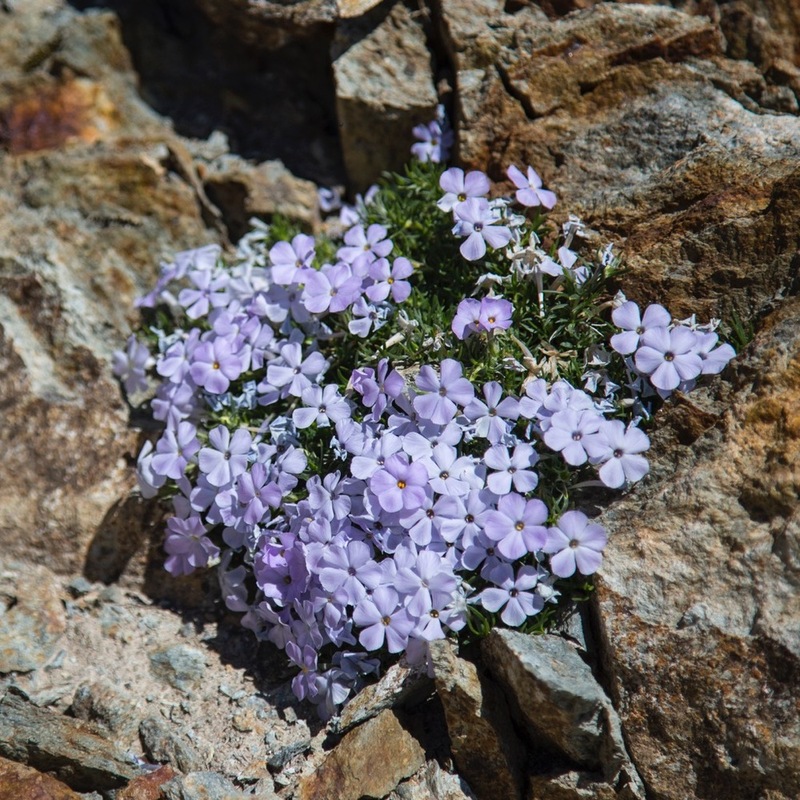 One of the reasons we came back again this weekend, was because we hoped the purple flowers would be in full bloom. This section was nice last week, but wa spectavcular this week! 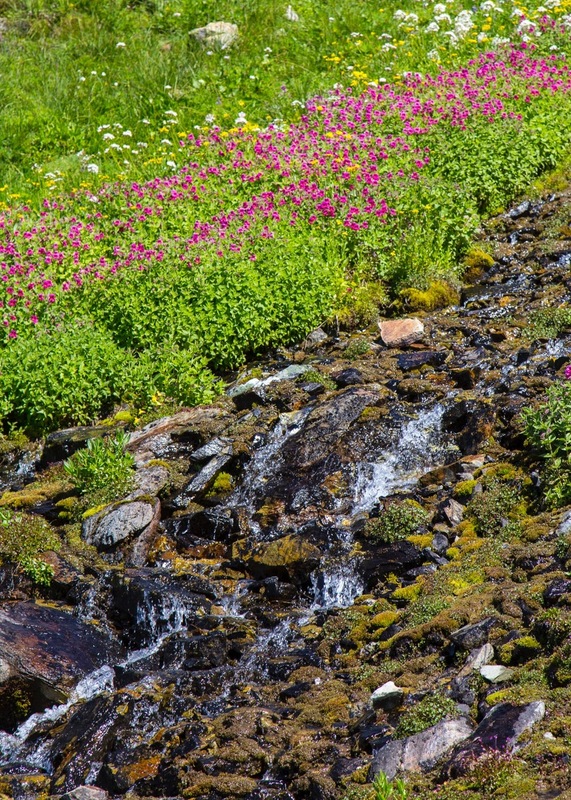 The flowers line the whole stream with a riot of colour. One of my favoourite photos from the hike. I had seen this shot last week, and knew this week would be so much better! Colour just covers both sides of the small stream. These flowersd were just amazing. In close on our favouritye flowers from the hike. 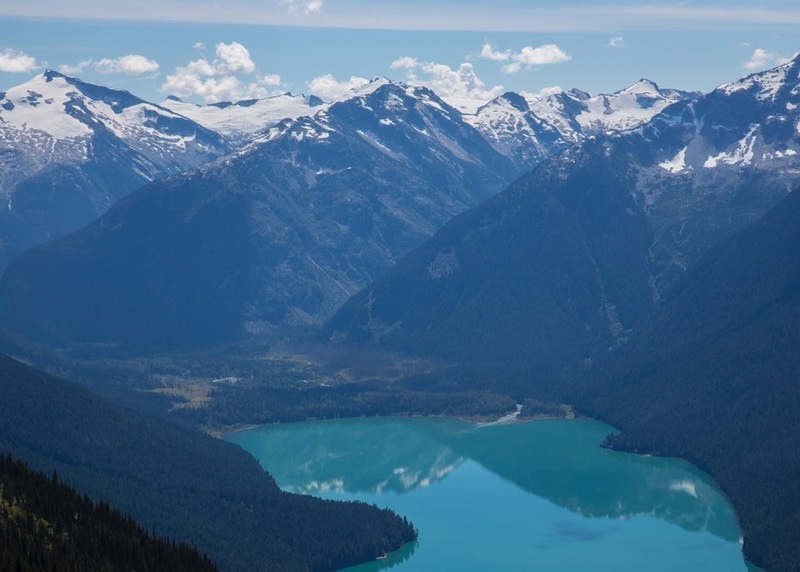 We barely saw Cheakamus Lake last week on the hike. We knew it was there, but it barely showed itself through the clouds. 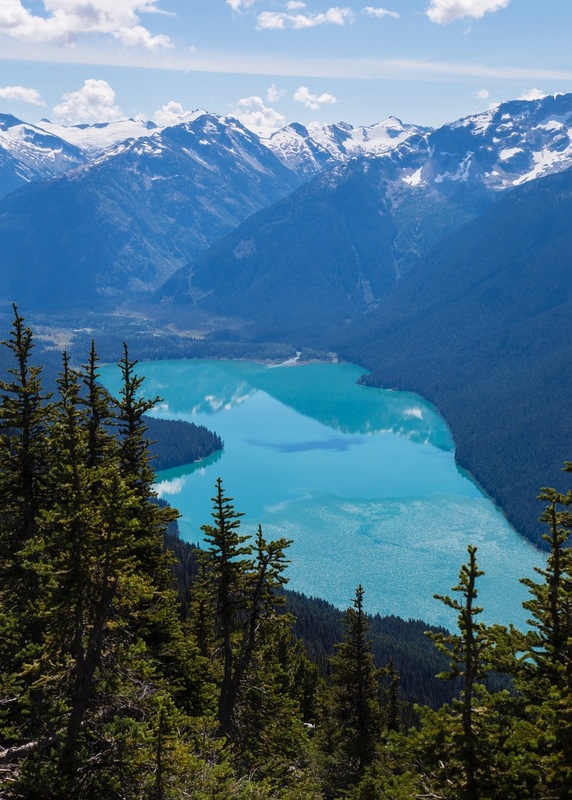 This week we got Cheakamus Lake in it's full, turquoise blue glory. Probably the best viewpoint of the lake. 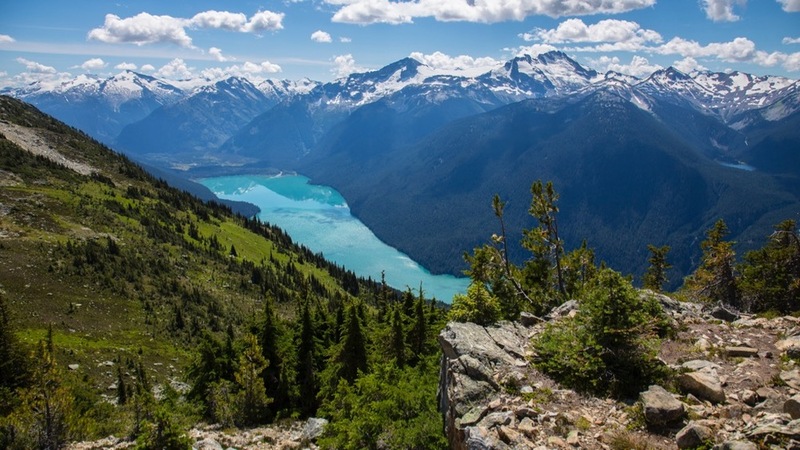 Not long after Cheakamus Lake, we made the turn up Half Note from High Note. 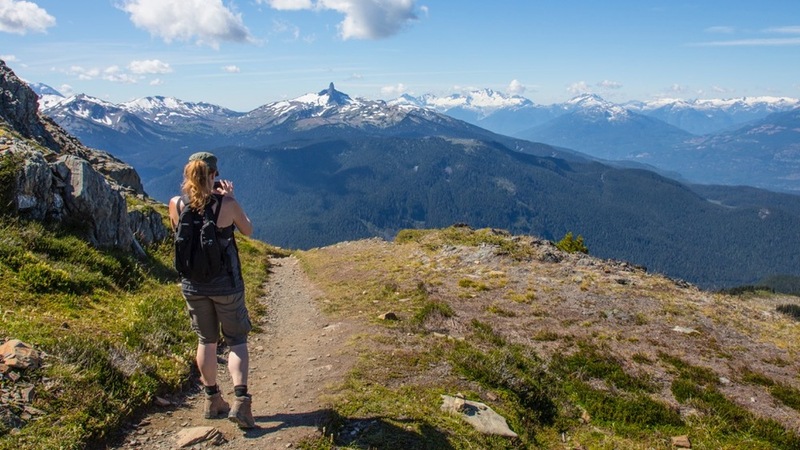 Overall the hike isn't as interesting, but it still has some amazing views. 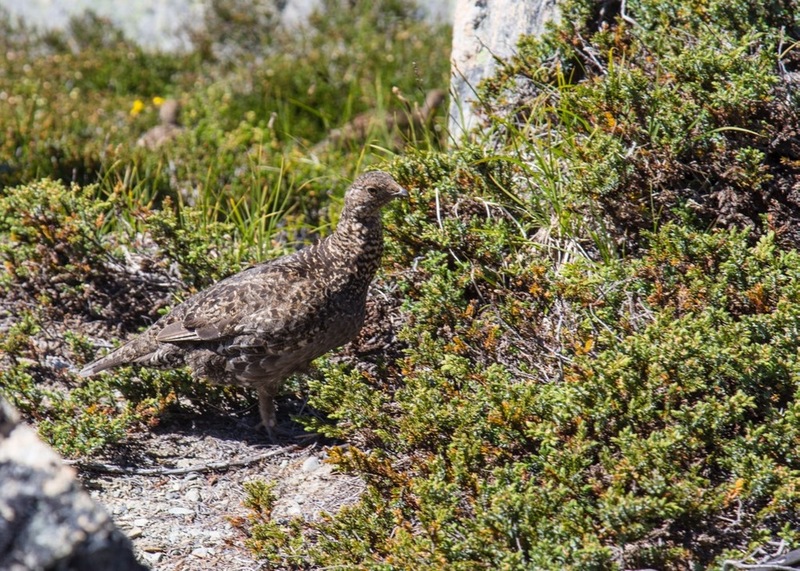 I believe this is a Willow Ptarmigan. We came around a big rock, and this one was just sitting there! 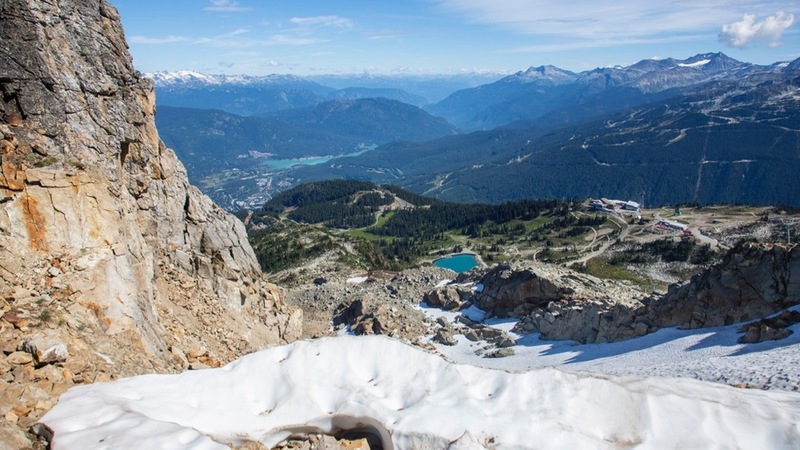 A look over to the glaciers across the valley near Blackcomb. 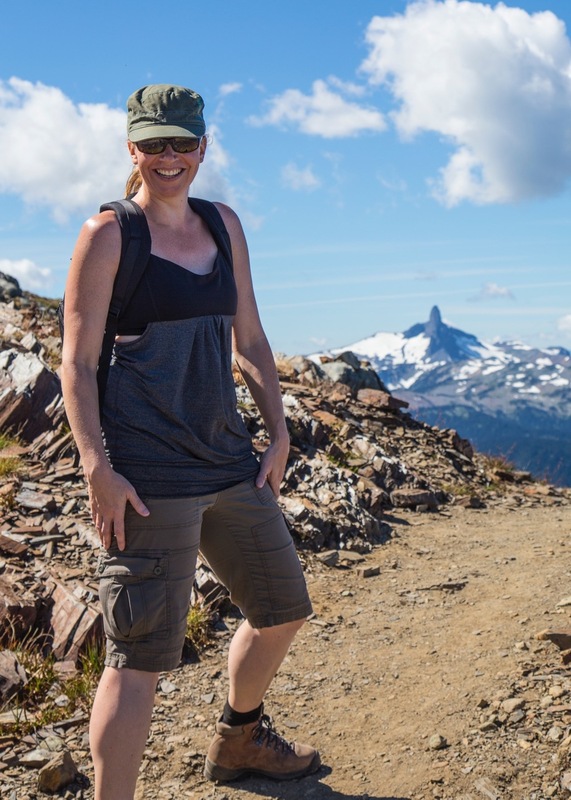 Justine enjoying the view of Black Tusk. 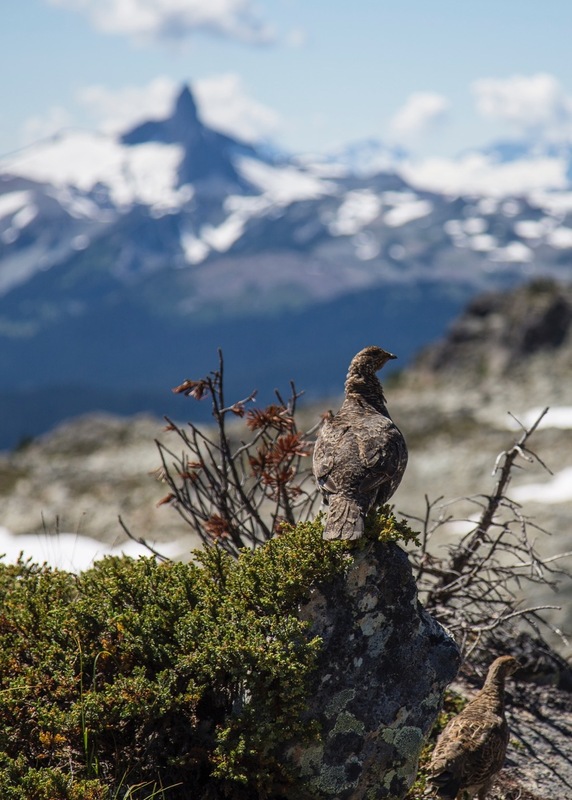 Even the Willow Ptarmigan enjoy the views of Black Tusk. There was a small family - 4-5 - of the birds. They really weren't worried about us at all. 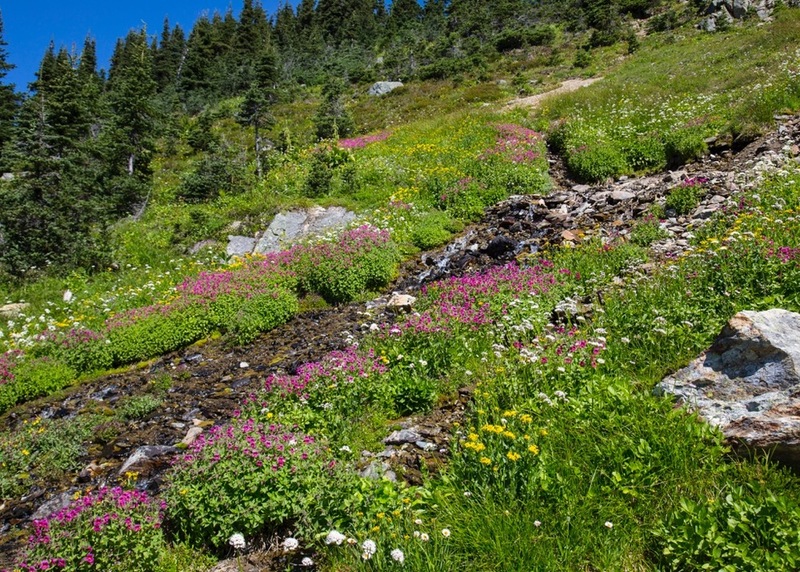 It's amazing where wildflowers will grow. 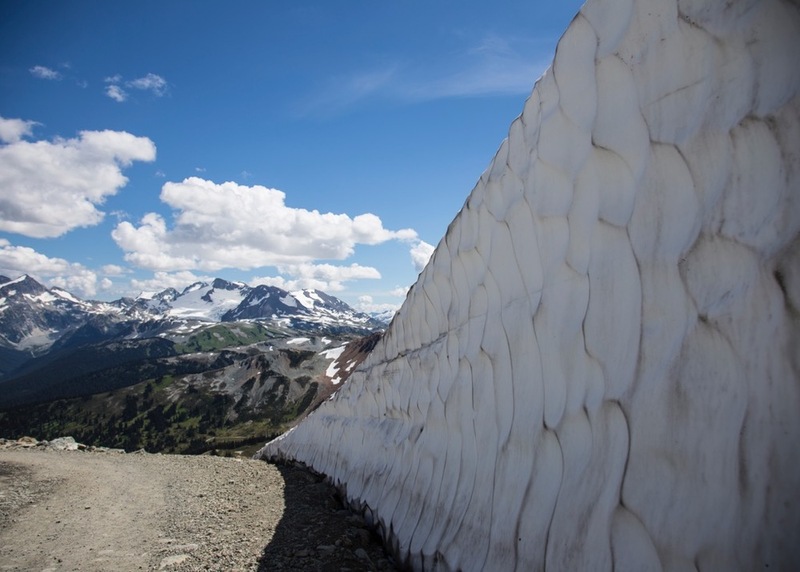 Back in June we had come up to see the snow walls. Most were gone at this point, but a few big ones were still surviving. The last small patch of wildflowers as we hiked back to Roundhouse. 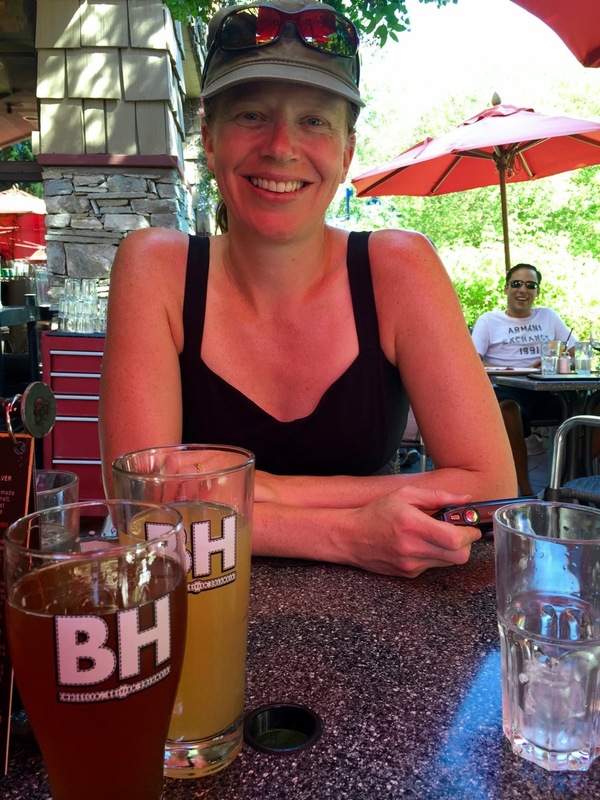 A well-deserved beer in the Village after our day in the sun on the mountain. 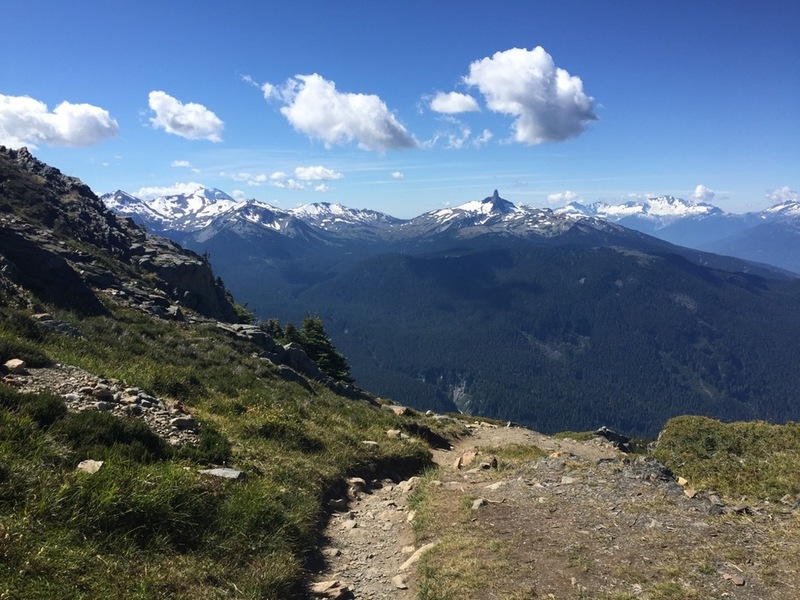 We've done quite a bit of hiking up at Whistler this summer. 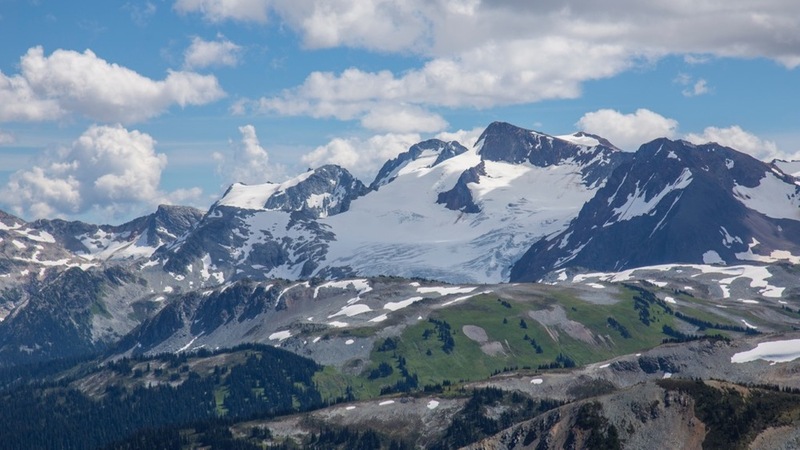 I'm not sure if we'll be back again before the snow flies, but who knows?